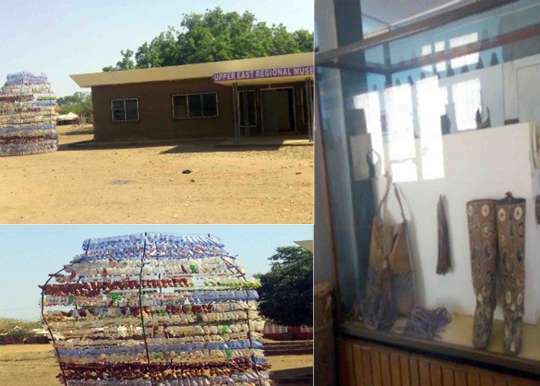 The Upper East Regional office of the Ghana Museums and Monuments Board (GMMB), as part of measures to rid off the environment of plastic waste, has initiated innovative plans to use plastic waste materials to design artistic collections. The move is to further instil in school children and homes, the need to recycle waste into useful ideas. The constructional art piece was made from empty plastic bottles and connected with electric bulbs, that provide light at night and also attract people to it during the day and at night. Ms Prisca Na’ambome Yenzie, Regional Director at the GMMB said in an interview with the Ghana News Agency that the idea was generated by the Bolgatanga Polytechnic in the Upper East Region, while the implementation and assembling of the art piece was made possible by staff of the Board. The display of the artefact was made possible when staff of the GMMB joined the Upper East Regional Minister in a cleaning exercise on Sanitation Day. She said the presence of the beautiful art piece also provided opportunity to draw the public closer to the museums, which was an ancestral home of many cultural heritages in the region. The Director, who is also an artist by profession, expressed disappointment at the low patronage by the members of the general public to the museum, and said the initiative had created awareness and given opportunity to members of the public to ask about functions of the museum. She noted that, people were beginning to forget the functions of the museum following increasing use of social media, and stressed on the need for government to assist the board to do more to let the youth appreciate their heritage. She mentioned the functions of the museums to include acquisition, protection, preservation, maintenance and education of the general public on objects and cultural artefacts in the region and preserved at the museums. She said the low patronage of the Museums was disappointing even though management charge only GHC 0. 50p to maintain the museum. She urged schools to visit the museum to educate pupils on the importance of historical artefacts and appealed to individuals and philanthropic organizations for support, adding that, the maintenance of the photo gallery at the museum was through personal contributions of staff members. The Regional Museums and Monuments Board, established in 1991, was the brainchild of Professor Benjamin Kakpenyen of the University of Ghana.